This issue is aligned with the theme of Imagining America (IA)’s 2013 conference, “A Call to Action,” described as a future-oriented democratic revival. We invited submitters both to look backward to sources, methods, and ideas that energize them—a revival—and to look forward to more effective and energizing ways to do their most meaningful work. The result is an issue that foregrounds innovative steps people are taking to honor and reinvigorate long-held commitments to humanities, arts, and design in public life. The submissions in the first section come from the 2013 conference, as IA began to explore what it means for them to organize, which Marshall Ganz describes as “working with other people in a way that respects and enhances their agency and [one’s] own at the same time’ (Moyers 2013). In their submission, IA co-directors Timothy Eatman and Scott Peters ‘invite and challenge colleges and universities to see themselves as part of, rather than simply partners with, their communities.” The conference keynote, a warm conversation between outgoing SU Chancellor Nancy Cantor and one of her core Syracuse partners, Chief Oren Lyons, a faithkeeper of the Turtle Clan, Onondaga Council of Chiefs, Haudenosaunee, follows. Lyons begins by emphasizing the centrality of art in a young person’s development. Cantor concurs, and emphasizes central New York’s “spiritual, environmental, artistic sense of values, of democratic purposes, of ways of coming together as a people.” She urges the region “to return to those roots in lots of different ways, and allow the new roots of diversity to really take hold.” Continuing IA’s tradition of young scholars responding to the conference keynote, PAGE fellow Cecilia Orphan and IA Assistant Director Jamie Haft hone in on Cantor’s and Lyon’s critique of the cult of expertise and prestige. The section concludes with cultural critic Arlene Goldbard’s description of the process she and her team undertook at the conference, tracking generative themes, issues, and action opportunities for post-conference follow up. The Principles and Practices section (formerly “Features”) emphasizes the integration of organizing into IA’s ongoing commitment to public scholarship. Mary Rizzo exemplifies IA’s growing partnerships with state humanities councils, which furthers the organizing component of IA’s identity. Dana Edell, Adam Horowitz, and Cordelia Istel playfully document an imagined United States Department of Arts and Culture, suggesting the role of the imagination in organizing. David Scobey’s “The Invitation” speaks to IA’s commitment to the particularities of public scholarship. Anthropologist Michele Boyd foregrounds knowledge received through the senses, situating audiotapes as research ends rather than only as research means. The notion of revival is expressed subtly throughout the issue, a sense that while committed to a democratic interpretation of their respective professions, contributors are looking to find more ways to effectively manifest that in the world. In the Resources and Case Studies section, Bob Leonard shares how he, a group of students, and local artists adapted theater exercises to a regional planning effort resulting in greater inclusion than surveys alone provide. Spanish language teacher Felisa Guillen describes restructuring her class so that the translations her students do with educational, healthcare, and legal organizations position them as partners rather than helpers, developing relationships that will last beyond college. Stephani Woodson lays out her adaptation of criteria for arts pedagogy that IA director emerita Julie Ellison developed for public humanities courses. And Louisa McCall, co-director of Artists in Contexts, focuses on the explosion of artists aligning their work with people of other expertise in order to expand its usefulness. In the last section, Lisa Yun Lee reviews Design and Ethics: Reflection on Practice, edited by Emma Felton, Oksana Zelenko, and Suzi Vaughan, and Bruce Burgett reflects on Richard Brodhead et al., The Heart of the Matter: The Humanities and Social Sciences for a Vibrant, Competitive, and Secure Nation, and Toby Miller’s Blow Up the Humanities. 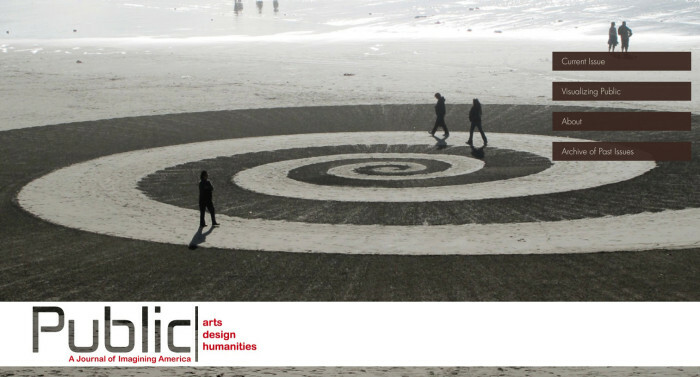 Weaving through all the submissions is IA’s touchstone: the centrality of arts, humanities, and design in its work, both within higher education and between it and the surrounding world. With the new work published in this issue come new connections and relationships within the growing body of material that forms Public. We can now officially consider this repository to be an “archive,” building on the collection of documents from our first, double issue. By integrating and displaying the newly published material with this archive, the data visualizations not only continue to provide a creative means to explore the journal’s content, but offer opportunities to discover (or uncover) unanticipated connections between our submitters’ ideas, geographies, affiliations, and subjects. Additionally, with a greater body of content come more possible channels of exploration. We encourage you to consider how the interactive access to this archive can be used as a tool as well as a resource; how online media and the networks they help establish have played a role in recent social and political events. How, as a public scholar, might you discover such networks through your own work and expand your base of collaborators? How might the interactive visualization of Public‘s content help serve as a form of validation and contextualization for work that is operating outside the bounds of disciplinary scholarship, methodology, or organizational structure? We have taken the opportunity of this second issue to rigorously update the metadata that is used to describe all of the published work so that the two information visualizations will be able to provide richer, more meaningful interconnections within the growing archive of published work. We hope that future submitters will consider the value and potential of metadata as an integral component of their work, expanding their sense of the multiple ways that their ideas may be expressed online. We have worked to be inclusive of alternative forms of publication, and have developed peer-review and editorial processes that include a full range of digital media. Sound is a way to extend the territory you can affect. . . . They cannot change the air in that space. If you enjoy this issue, please pass it on to friends and colleagues. Thus far Public has been viewed across the United States and in 38 countries around the globe. And click here for a link to the new call for submissions to Volume 3, Number 1: Organizing. Culture. Change., our next issue aligned with the theme of Imagining America’s 2014 conference in Atlanta, GA.
Marshall Ganz. Moyers & Company. By Bill Moyers. May 10, 2013. Transcript and video, 33:44. http://billmoyers.com/segment/marshall-ganz-on-making-social-movements-matter/. Reagon, Bernice Johnson. 1991. PBS. The Songs are Free: Berenice Johnson Reagon with Bill Moyers. Public Affairs Television. Produced and directed by Gail Pellett. South Burlington, VT: Mystic Fire Video. http://gailpellettproductions.com/the-songs-are-free-bernice-johnson-reagon-and-african-american-music/.